To serve and support the keiki of Hawaiʻi by providing diapers and wipes to organizations that assist low-income families with young children. One day, in Hawai'i, all children ages 0-5 will have access to diapers, wipes, and other basic essentials. We believe no child should suffer from diaper need. All children deserve access to clean, dry diapers. Access to diapers improves the physical, mental, and economic well-being of babies, families, and communities. Hawai’i Diaper Bank (originally Big Island Diaper Drive) was founded in 2016 when founder and president Jessica Histo, a registered nurse, was looking to donate diapers that were outgrown by her son and found no Big Island organization focused on accepting diaper donations and distributing them to families in need. Through further research, Jessica became aware of the pervasive problem of diaper need on the Big Island and committed herself to filling that need. 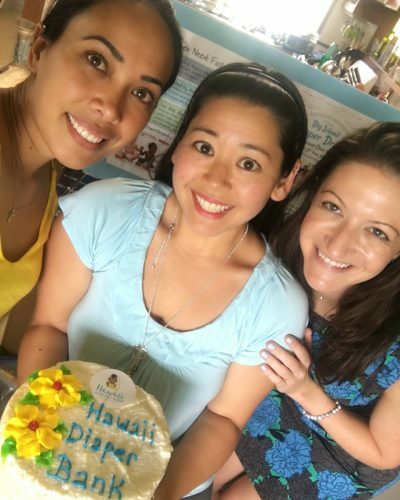 Hawai’i Diaper Bank (HDB) held its first diaper drive in 2016 during Diaper Need Awareness Week (DNAW) (when diaper banks from across the country work with local and state governments to raise awareness about diaper need and plan events to rally sustainable support for diaper bank programs). Over the course of that week, HDB collected and distributed more than 4,000 diapers (as well as wipes) to low-income families with young children. Thanks to the generous support of Big Island residents, donations continued to roll in following the 2016 diaper drive, and in 2017, HDB held its second diaper drive during DNAW, collecting and distributing more than 5,000 diapers (as well as wipes)! In 2018, HDB incorporated as a nonprofit and welcomed its inaugural Board of Directors. At this time, HDB is a community project under the fiscal sponsorship of Hawai’i Children’s Action Network. HDB is passionate about eliminating poverty and improving the health and well-being of Hawai’i’s keiki. Currently, HDB is 100% volunteer run, but we are in a period of rapid growth and look forward to broadening our impact in the community. Jessica is a registered nurse on the Big Island. She earned a B.S. in Nursing from Hawaii Pacific University. A published author in childbirth education and former co-chair of the Association for Women’s Health, Obstetrics and Neonatal Nurses (AWHONN), Hawai’i section, Big Island chapter. Jessica currently serves as a nurse in the Maternity Ward at Kona Community Hospital and teaches prenatal classes and Intermediate Fetal Monitoring. Jessica founded the Hawai’i Diaper Bank as the Big Island Diaper Drive in 2016 and currently serves as the President and Board Chair. She resides in Kamuela with her husband Ka’imi and their son Dylan. Born and raised on the Big Island, Jay currently resides in Honoka’a with her husband Lydell and their children Tyton and Talyn. She previously worked as a phlebotomist for Clinical Labs of Hawai’i, serving patients from North Hawaii Community Hospital and Hale Ho’ola Hamakua Hospital, among others. Recognized as an active, generous and reliable volunteer in her community, Jay became involved with Hawai’i Diaper Bank in 2016, helping to collect and distribute diapers to children in need on the Big Island. Jay believes that no child should go without life’s basic essentials, and is thrilled to be able to support HDB’s efforts to alleviate diaper need on the Big Island. Hannah and her husband Jeremy moved to Kailua Kona in February of 2018. She was born and raised outside of Chicago, Illinois and received a B.S. in Human Development from Cornell University. After graduating, Hannah was accepted into Teach for America and moved to Los Angeles, California, where she worked as a Head Start teacher while earning her Masters in Early Childhood Education from Loyola Marymount University. She went on to attain a J.D. from the UCLA School of Law and, after law school, served as the Program Director for a prominent diaper bank in Los Angeles. Since coming to the Big Island, Hannah has worked as an education consultant. Hannah is thrilled to be able to employ her diaper bank experience to help Hawai’i Diaper Bank serve Big Island keiki.